Price Wagon is one more worthless adware program that should be removed as soon as it is found running on your PC. Due to hoax marketing strategies employed by vendors of Price Wagon, quite a few users might be lured into downloading and installing this useless application. The statements on the official website promise users to improve the experience of online shopping. You should be provided with best discount deals and various coupons, unfortunately, this is not true whatsoever. All that this intrusive adware application is capable of is causing endless annoyance and frustration while you are browsing the web. Read the rest of this article and find out why the removal of Price Wagon is so important. We also provide a detailed removal guide that will help you delete Price Wagon in no time. 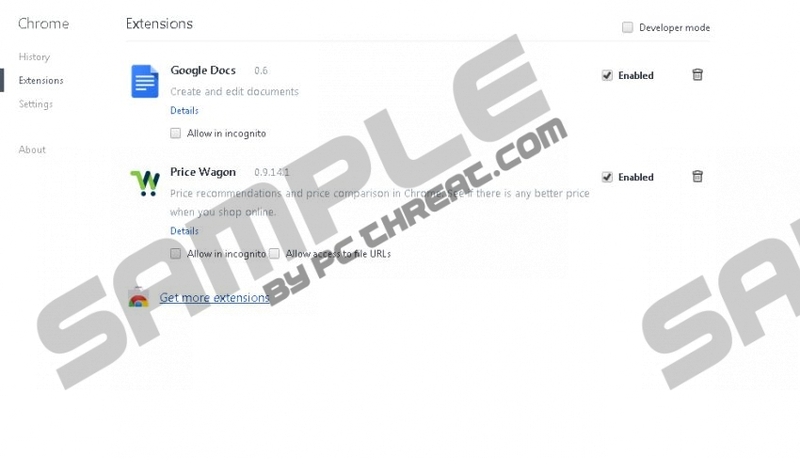 Once Price Wagon enters your operating system, web browsers such as Mozilla Firefox, Internet Explorer, and Google Chrome will be implemented with extensions. These extensions are used to present numerous third-party commercial ads and annoying pop-ups. Everything that Price Wagon provides you with will make your life miserable, to say the least, as you will have to fight your way through ads and pop-ups every time you browse the web. Only complete removal of this intrusive adware program will fully restore the normal functionality of your browser. In addition to being annoying, Price Wagon could turn out to be quite malicious as well. During the research it has been noticed that some ads that this adware program provides could be implemented with redirect links. This is an extremely dangerous instance, as you could end up on potentially malicious web pages. For example, you could land on a website running an arbitrary code execution exploit, meaning that just entering such website is enough to get your operating system infected with some sort of malware. Price Wagon is a major virtual threat that should be removed without any hesitation whatsoever if you wish to have a PC free of any kind of malware. Fortunately, the removal procedure of Price Wagon is rather simple. You can remove this invasive adware program via Control Panel. This will certainly stop the annoying and potentially malicious activity that Price Wagon exhibits. Unfortunately, is some cases traces of the infection could still be active on your PC even after manual removal is executed. In order to make sure that every bit of Price Wagon was removed; please scan your PC with a professional antimalware tool, after you have executed the manual removal. Select Price Wagon and then click the Uninstall button. Double-click Price Wagon and select Uninstall. Quick & tested solution for Price Wagon removal.